A few weeks ago I posted a picture of the old Masonic Lodge in the old town. There's nothing left but potholes, kudzu, and brambles as thick as a broom. We'll, there are the old pictures taken through the years and the memories. When I was a kid, the wall on the west side of the main street had a fresh coat of austere gray paint stroked on it every few years. I'm guessing the railroad did that. The wall was the only thing between main street and the trains that rocked and rumbled through the old town as regular as clocks back then. The only paint on that wall these days is sprayed on by teenage lovers and seniors from the high school a few miles away. WE ARE AWESOME, WE ARE GREAT, WE ARE SENIORS 98. And so on. 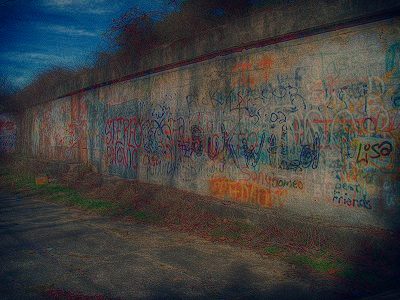 Sometimes graffiti on that old wall is ugly and often vulgar. But sometimes when the angle of light falls in a flattering way, it can be beautiful. Graffiti can indeed be artistic and lovely. Glad that you were able to see it this time and in this photo. I often enjoy the graffiti on the the freight cars themselves when I stop my car at a rail crossing. Figures and names pass in rumbles across the roads --a new American custom, I suppose. Those graffitis are rather plain in comparison to some that are truly artistic. Some are downright beautiful. The different shades of light can change everything. I agree with Geo. above about the train cars. BUT, but you do have an eye. Neat shot. I miss the trains rumbling along on a regular schedule. There are tracks a couple of blocks from here but the train runs every once in a while instead of daily at a set time. Some graffiti is beautiful; others, not so much!! I hate graffiti even though it's been around forever. I read they found graffiti in the Pyramids, left by the builders. I do not like to see graffiti on places owned by someone. Its so disrespectful. But I have to admit I love seeing it on trains. I wrote a post one one Graffiti Trains. Its takes a certain talent. Graffiti or street art--it can be pretty cool. When I visited my daughter in San Francisco several years ago, we were walking to City Lights Bookstore when my daughter realized that Banksy's artwork towered above us. We stood on a street corner to stare at it in wonder as the "Walk" sign changed over and over to "Don't Walk." We were thrilled to see a Banksy. Some of these people who are vandalizing property with their graffiti are so talented it is not funny, I'd like to see some of these people use their talents in a constructive manner.